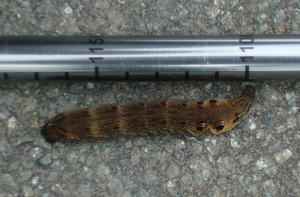 On the Severn Way from Caersws to Newtown on an Anniversary walk with my wife when she spotted this 7-8cm caterpillar crossing the road. Fortunately it was a narrow road and very minor. What should I have done, helped it on its way, which assumes it is trying to get to the other side, or leave it to fate? We left it, having taken a few photographs.